NETWORK FINALS: SUNDAY NIGHT FOOTBALL adjusted to 6.0, down a point from last week’s game. On CBS, where football slid the schedule, 60 MINUTES gained 0.04 to 1.9, NCIS: LA rose 0.1 to 0.9, and MADAM SECRETARY’s rating was 0.6, steady with last week. CABLE HIGHLIGHTS: AMC’s THE WALKING DEAD climbed 0.15 to 3.57, and TALKING DEAD was up 0.23 to 1.32, fueled in part by a crossover announcement held for late in the show; COMIC BOOK MEN was down 0.08 to 0.18. Hallmark’s movie SWITCHED FOR CHRISTMAS was at 0.92. On Showtime, SHAMELESS jumped 0.14 to 0.61, the just-renewed SMILF ticked up to 0.15, and WHITE FAMOUS was down 0.02 to 0.07. Adult Swim’s SQUIDBILLIES lost 0.07 to 0.40, and THE JELLIES was down 0.07 to 0.33. HBO’s CURB YOUR ENTHUSIASM ticked up to 0.31. Starz’s OUTLANDER slipped 0.02 to 0.26, and THE GIRLFRIEND EXPERIENCE was at 0.05/211K and 0.04/229K, compared to last week’s 0.07/0.06. 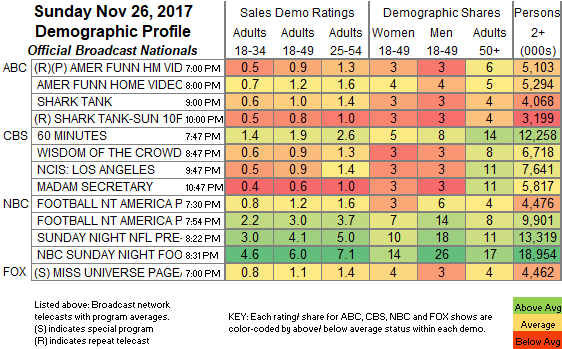 On TBS, SEARCH PARTY was at 0.21/0.13, compared to last week’s 0.26/0.18. TNT’s GOOD BEHAVIOR climbed 0.03 to 0.16. On Bravo, REAL HOUSEWIVES OF ATLANTA slipped 0.04 to 0.84, and XSCAPE: STILL KICKIN IT was down 0.02 to 0.55. Univision’s LIGA soccer match was at 0.59. On TLC, 90 DAY FIANCE climbed 0.08 to 0.55, and UNEXPECTED was up 0.08 to 0.32. ESPN’s COLLEGE BASKETBALL doubleheader was at 0.52/0.48. 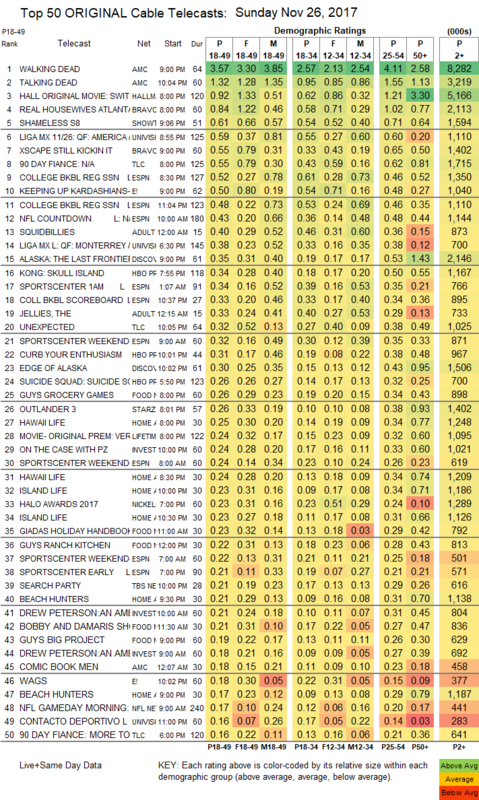 On E!, KEEPING UP WITH THE KARDASHIANS had a healthy 0.13 bump to 0.50, and WAGS was up 0.02 to 0.18. On Discovery, ALASKA: THE LAST FRONTIER ticked down to 0.35, and EDGE OF ALASKA was up 0.05 to 0.30. On Food Network, GUY’S GROCERY GAMES dropped 0.07 to 0.26, and GUY’S BIG PROJECT ticked down to 0.19. HGTV’s HAWAII LIFE topped that network’s line-up at 0.25/0.24, compared to last week’s 0.22/0.22. ID’s ON THE CASE fell 0.05 to 0.24. The HALO AWARDS were at 0.23 on Nickelodeon, 0.05/258K on TeenNick, and 0.04/189K on Nicktoons, . The SOUL TRAIN AWARDS were at 0.13 on VH1, 0.07/181K on BET,and 0.04/110K on MTV2.